Gite the spring, round house, quiet, large garden, games, pets welcome. House with 2 bedrooms, a bathroom, views of the countryside and cows. 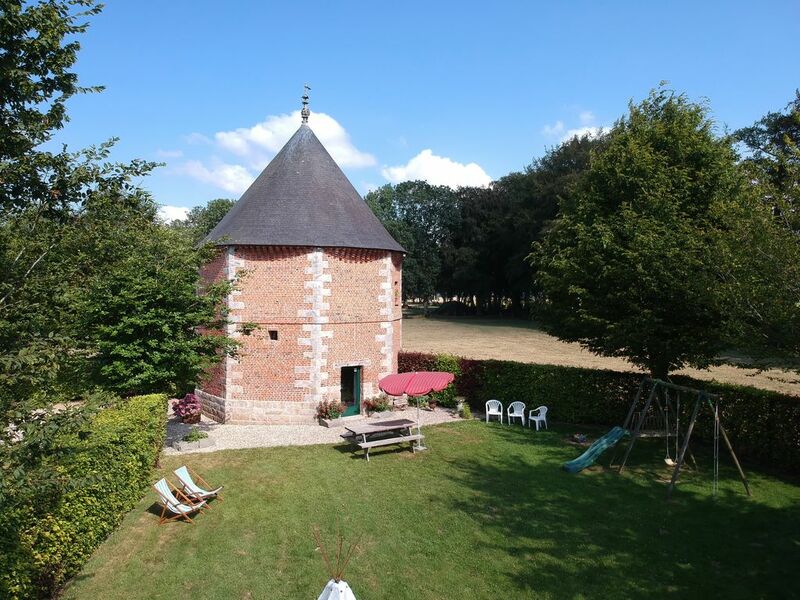 This round house is a dovecote of the XVII century. It is located in the countryside, in a farmhouse, the place is quiet and clean. No immediate neighbor. Built in brick of St John, flint and sandstone. The owners live in the farm house on the same property. The cottage includes a kitchen open to the living / dining area. The kitchen is equipped with an electric convection oven, 3 gas, an electric hob, a microwave, a dishwasher, a coffee maker, a breadboard, a grill bread, kettle and fridge / freezer. The living / dining area is equipped with a sofa, armchairs, a flat screen TV with DVD player, and a large table 6/8 places to take meals. Extensions available. A beautiful master bedroom (bed 1.40 x 1.90) with lots of charm, bricks and exposed beams. A bathroom with shower, sink, washing machine, towel dryer, hair dryer. The toilets are independent. A room for children, the room and round shaped tipi. 3 beds 0.90 x 1.90. The garden is private and fenced, a space is reserved to park two cars. Children can go tobogganing, swinging, sandcastles ... You can dine outside, grill. Complete baby equipment (free): changing table, travel cot, bath, high chair. The +: a barrier secures the stairs, games for young children and adults. Located halfway between Rouen and Dieppe, access is easy by the highway. From there we can go to visit all the local cultural and artistic wealth. The sea is not far. From here you can easily discover the Normandy coast Dieppe cliffs, the beach, the harbor. You can also visit Etretat and these famous cliffs. Make a pleasant walk in Veules les Roses (one of the most beautiful villages in France). Stroll the streets of Rouen, admire the half-timbered houses, visit the magnificent belfry said "The big clock" 400kg clock and a diameter of 2.50m, visit the majestic Gothic cathedral, where the church of St. Joan of Arc completed in 1979. For the parents : I put at your disposal, a cot with a foam mattress of 10cm, a small bath, games, a changing table, a pot, a high chair, ... stairs barriers, games ... For your leisure: Bike rental In the garden, you have a wooden porch. With a swing, a slide, a ladder and a swing face to face. We had a fantastic stay in the Gite du Colombier, an amazing building, beautifully restored and set in tranquil surroundings of a working farm. The gite is comfortable, spacious and well equipped and Claire was a friendly, welcoming and helpful host. It is an ideal base or exploring Normandy and we had some great days out. We look forward to returning to this lovely place and would thoroughly recommend it. Et les adultes .belle rénovation avec goût. Merci beaucoup pour ces agréables compliments. Nous aurons plaisir à vous revoir avec vos petits enfants. Sympathique accueil dans un bel endroit calme et naturel. Le top : l'aménagement intérieur du gite (c'est un ancien colombier m'a dit la propriétaire), les murs sont arrondis avec de belles pierres et charpentes apparentes. J'ai aimé les vaches se baladant dans la prairie à 5 mètres du gîte. Ravi de cette expérience unique ! Je recherchai le calme pour un grd repos, j' ai trouvé mon bonheur à la printanière . C'est parfais, l'accueil est super, je recommande cette adresse. on est venus en voisin pcq notre maison est trop petite: notre fille voulait organiser une soiree pyjama avec TOUTES ses copines. le gite est spacieux, super equipé. une fonction par etage = tranquilité pour tous. l'originalité du batiment crée un depaysement qui a beaucoup plus à tout le monde. on a recommandera à nos connaissance et on reviendra. The farm cottage in Normandy, Seine Maritime, near the villages of Tôtes Auffay and Clères between Rouen - Dieppe, Etretat and Yvetot. You will find your family a comfortable location, friendly and clean. Close to shops, large, rich in heritage, the beach, large lawns of Dieppe 25 minutes. "The city of 100 spiers" dear to Victor Hugo, is a city of art and history, rich architectural heritage. The industrial capital of Normandy. Small fishing port in the Middle Ages, Dieppe has become over the centuries a major port city. Despite the destruction of a tragic landing during the Second World War, the city has kept a lot of charm. - The castle-museum. By visiting this citadel of the fourteenth century, you will discover a beautiful monument, very well preserved and a museum of maritime life of Dieppe and its great history of ivory. - The Saint-Jacques church, Gothic monument built between the twelfth and sixteenth century. - The Saint-Rémy church. Built in the sixteenth century. The eighteenth century organs are remarkable. - The Quai Henri IV. Beautiful houses and mansions. - The door Turrets. The only visible remnant of the ancient walls. Golf Dieppe offers a beautiful 18-hole (par 70 to 5763 meters) at the top of the cliffs (great views!). The famous needle stands in the extension of the cliff of Aval while the Chapel of Our Lady of the Guard is in front, on the cliff of Upstream. Both sites are within walking distance of the village center. - 'Le Clos Arsène Lupin, Maurice Leblanc House' is an original place. Step into the secret world of the famous Gentleman Burglar. - Of Etretat golf course at the edge of a cliff ... 18 hole par 72 (about 6073 m), which benefits from an exceptional environment. Since the late 19th century, VARENGEVILLE SEA became a residential village, privileged place for painters, musicians, writers, artists of all kinds or just nature lovers. - The marine cemetery. Contrary to what the adjective "seaman" might suggest, this small cemetery has practically no graves of sailors and fishermen. The cliff making installation of an impossible harbor, there were few fishermen in the village. "Marin", it is still in its position perched on the cliff overlooking the sea eighty meters. - The Church of St. Valery, located on the cliffs of Ailly, hidden among the gardens and woods along the cliff, the church of Varengeville overlooking the sea. VIEW beautiful !!! Be seduced by one of the most beautiful villages of Normandy combines, over the 1194 meters from Veules (the smallest river in France), the charms of the sea and the countryside. Listen sing water in the wheels, or take a walk in the paths that line the Veules, enjoy the view over the cliffs. Wander the streets, in the present or the cavées with evocative names, you will travel through history and time in the spirit of Maupassant. You will find the architecture of the cottage in the seaside villa of the beginning of the century through the fishermen's houses and landscapes, woods, filled with secret gardens of flowers especially roses. Of modest dimensions, Saint-Valery-en-Caux is a resort that does not lack charm. The harbor, the waterfront, the old quarter of the Penitents offer you beautiful walks. - The harbor basin is dug deep in the Valeuse between two hillsides. Enjoy walks along its banks leading down to the beach and the cliffs. - The area of ​​penitents. On the west side of the defile, it flowered area is very picturesque with its traditional houses flint. At the top, you can visit the cloister of the convent of the Penitents. - The St. Valery Church (XIII century). - The cloister of penitents. - The house Henri IV. A kindergarten on the waterfront.